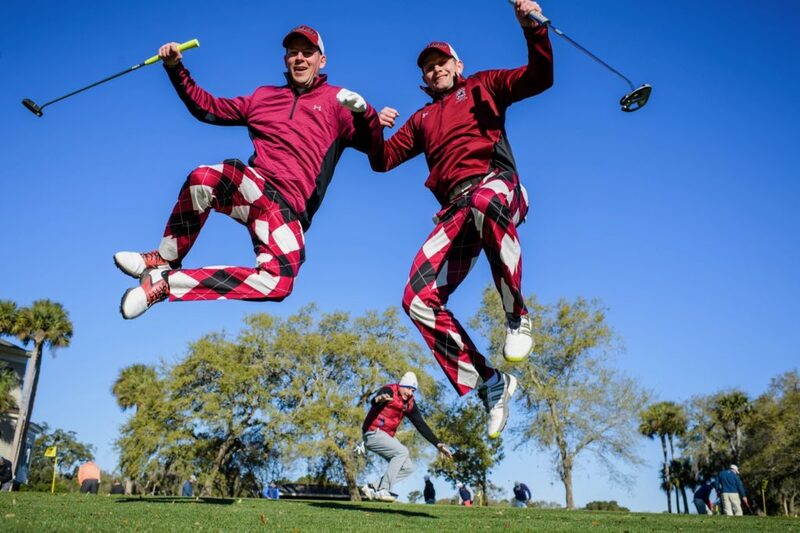 Every year in late February, two-man teams of amateur golfers gather at Kiawah Island to compete for the resort’s Friendship Cup. Over the course of two days, these teams vie for bragging rights on two of Kiawah’s courses — including one round on the famed Ocean Course, home of the 1991 Ryder Cup and the 2012 and 2021 PGA Championships. The other round rotates annually among Kiawah’s other championship courses. Due to the size of the field, as one of Kiawah’s most popular events, the shotgun start format splits the field between the two courses. The team net best ball format ensures the competition remains particularly fierce, yet friendly. Since the extended four-day weekend fosters fellowship as much as competition, ample social opportunities help round out the event. The weekend tees off on Thursday night with a culinary celebration that honors past champions, including the previous year’s winners. After Friday’s opening round, golfers gather at Mingo Point along a sweeping curve of the Kiawah River to enjoy a laid-back al fresco barbecue and oyster roast. Still, teams want to guard against having too much Friday fun in anticipation of round two the next morning. With the last putt dropped and scorecard signed, competitors gather at the Grand Oaks Ballroom in The Sanctuary hotel to enjoy the awards celebration. In addition to bragging rights, the top-ten net teams receive outstanding trips, while enviable prizes also go to the top gross team, top gross individual, top net individual and top net senior division (55 and older) team. In addition to the opening celebration, the Mingo Point barbecue and oyster roast, and the awards banquet, teammates also relax with a nightly post-round hospitality suite and numerous competitions for various prizes peppered throughout the weekend. To make the most of the long weekend, teams are encouraged to take advantage of some excellent package deals that combine the tournament with lodging, daily breakfast, daily boxed lunch with one-course adult beverages, the three evening culinary celebrations, the hospitality room and a tournament gift bag and amenity package worth $500. Picking your partner and registering is the first step. But after that’s all settled, don’t forget to select your team name, and colorful team uniforms remain and enduring Friendship Cup tradition. For more information and to book your package, call (800) 654-2924 or click here to register your team.